Founded in 1928 by Trafton Cole and Eddie Haan, global lifestyle label Cole Haan stands out for its commitment to quality and superior craftsmanship. Known for its iconic driving shoes, Cole Haan now offers a wide range of products including bags, belts, and other accessories. The Cole Haan men’s shoes collection, with an array of creations from comfortable penny loafers to elegant wing-tip oxfords, provides extensive choices for each occasion — whether it is a formal evening or everyday outdoor wear. Shop Neiman Marcus for an assortment of stylish Cole Haan loafers, Oxfords, Chelsea boots and more. 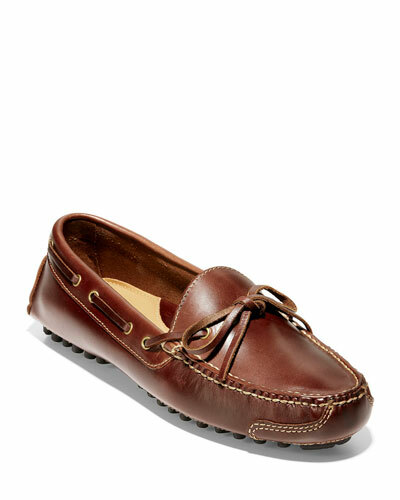 Bally driving shoe in smooth calf leather. Moc toe construction. Silvertone B detail at vamp. Embossed logo lettering at collar.